High Tide: 7.18 feet at 10:41 a.m.
Low Tide: 1.73 feet at 4:38 p.m.
2-3 ft. 2-3 ft. 3-4 ft. 3-5 ft. 3-4 ft. 2-3 ft. 2-3 ft.
2-4 ft. 3-4 ft. 4-6ft. 4-5 ft. 3-4 ft. 2-3 ft. 2-3 ft.
2-4 ft. 4-5 ft. 5-7 ft. 5-7 ft. 4-6 ft. 3-4 ft. 2-3 ft.
Caribbean - This week is quieter with waves waist to chest high from the ENE. The swell only picks up early Saturday when there will be some chest high plus sets. It lasts through Monday but then fades back to knee to waist for Wednesday. Pacific - The first big SSW swell of the year arrives Friday (2.3 feet at 18 seconds) and maxes Sunday (3 ft at 15 seconds) which translates to surf 1-2 feet overhead and some spots a couple of feet bigger. The swell fades quickly through Monday and by next Wednesday it's back to knee to waist high. Long range models show a similar swell arriving the following weekend, too! Louis at Hotel Las Tortugas - 1/28 - The light off-shore breeze is fanning the chest high small surf into perfect little barrels for the morning high tide. The crowd is manageable in the morning and a lot more intense in the afternoon for the second session. There are short periods of on-shores helping the water to warm up from the upwelling condition of last week. Andres at SurfingNosara.com - 1/29 - Another beautiful day and nice conditions. The waves are a great, small and fun, good size. They ran waist high to chest high when the tide was high. Probably when the tide started to change was a good time to enjoy the wave. 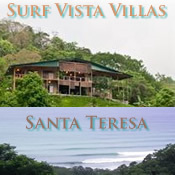 Christina at Surf Inn Hermosa - 1/29 - FUN FUN FUN SSW – WAIST TO CHEST HIGH 3-5ft+ and FILLING IN FOR HEAD HIGH WAVES MID WEEK – Clean and Beautiful at the Beach This Morning - High Tide mid-morning – Sun is out strong in Playa Hermosa. Colin at Una Ola Surf Camp - 1/26 - Knee high waves. Best at the rivermouth on the higher tides. Light winds all morning. It’s pretty much flat, but had its moments for longboarding.